Thanks for bearing with us while we went a little Star Wars crazy these past few weeks. While we can’t promise we won’t ever go back to that most distant of galaxies, I can assure you of at least a few weeks of more grounded comics. We will be going back to the gaming board, so to speak. The past few weeks have been very busy for myself and Aileen, and with things calming down a bit now, we will be getting back to the gaming table in a more literal sense as well. A handful of games of Cosmic Encounter, and some Space Hulk is all the gaming that I have managed in the past month, and as my time begins to free up, I’m finding myself thinking more and more about what we will get to play. Finishing our Risk: Legacy campaign and getting Imperial Assault out of the box is pretty high on that list, but there is a pile of games awaiting our attention on the floor behind me as I type. Literally on the floor. Getting some new shelving units to accommodate our growing collection is actually first on the to-do list, and navigating the tricky corridors, traps, lures and myriad dangers of the dungeons of IKEA is the first game we will be playing. Kitchen gadgets we will never use and more flat packs than our car can safely hold will be our treasure, and untold hours of struggle with diagrams, screws and drills our legacy. Perhaps it will be longer than I thought before we return to the gaming table. If I don’t accidentally affix said table to a wardrobe or TV stand, that is. Close to the top of this pile of games is Alchemists, which we have only played once. Although I struggled with the deduction elements, I loved our playthrough and want to try it again. If you’ve been following the comic, you will have gathered we play more sci-fi than fantasy themed games. Alchemists may in fact be the closest to a fantasy-setting of any game we own. I think it says a lot that after a whole year our comic has yet to feature a single wizard, which is a borderline-criminal under-representation of one of gaming’s greatest ambassadors. I’m surprised we haven’t had an angry letter from the guild, really: as I think we might be sailing close to discrimination with regards to our bearded brethren (wizards, not hipsters). I’ll have to wrap up this week’s blog post before I even pretend to get to any discernible point. The alluded-to busy period hasn’t quite wrapped up yet, and I have to go measure some walls, games, shelves and floors. Shh! FFG may be reading this, we don’t want to give them any ideas. Cosmic Encounter is one of my favourite games! You can get such fun power combos (and sometimes horrible horrible combos). Yes, we too suffer from a lack of floor space because of unshelved games. Problem is, we don’t have any wall space to put another set of shelves… So Step 1 really needs to be: acquire bigger house. We haven’t been playing Cosmic Encounter for that long yet, but it’s been a delight. Each game has been wildly different, and we haven’t seen a fraction of the alien races yet. It really deserves its reputation as a classic. 1) bring your addiction to your place of work or study . . .
Just a matter of convenience. I don’t have gaming friends, but my colleagues like to play. So instead of going to some place, we play at work after the working hours (in the recreation room). This way we still have some time left for families and other stuff. Granted, i was the one introducing them to board games. But i think this “addiction” is not so harmful (we play once per week) and actually helps bonding us. Space is such a concern for me that I will hesitate buying a game just because of the size of the box. 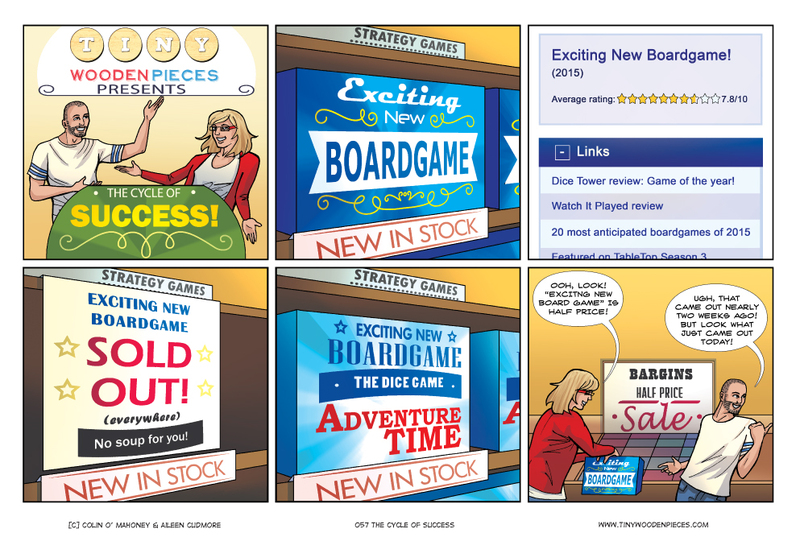 One of my major frustrations with the board game hobby is that there are essentially two timelines. There is the timeline for those who go to conventions and have the inside hook up and know what to look for on Kickstarter. Then there is people like myself, collectors that don’t have any inside scoop on things. For me, all the hottest games are always sold out, and by the time they come available, there’s no one left who wants to play it because they’re all on the next thing. The most frustrating part is seeing games make it on the top 10 list of 2015, 2016, etc., and the game isn’t even technically out yet. But to insiders, they don’t care, because as far as they are concerned, that game is old news. Ugh. At least there are a bunch of people that care enough to play games before I get around to buying it so that by the time I can pick it up, it’s pretty clear if it’s all hype. Seafall comes to mind.